UCLA named former Seattle Seahawks and Atlanta Falcons head coach Jim L. Mora its Head Football Coach, replacing the departed Rick Neuheisel, it was announced Saturday by UCLA Director of Athletics Dan Guerrero. Mora will be formally introduced to the Los Angeles media at a press conference early next week. 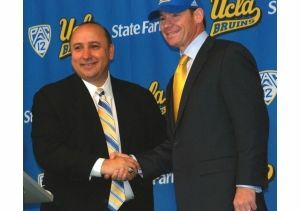 "I am proud to announce today that Jim Mora has accepted the position of head football coach at UCLA," said Guerrero. "He has been a head coach at the game's highest level and has clearly demonstrated to me that he is hungry and eager to return to the sidelines." Mora's father, Jim E. Mora, was a prominent collegiate and NFL head coach, whose career included a stop at UCLA in 1974. The younger Mora, 50, began his head coaching career with the Atlanta Falcons in 2004, and led Atlanta to an 11-5 regular season record and first place in the NFC West. After defeating the St. Louis Rams in the Divisional round, the Falcons' season ended in a loss in the NFC Championship Game to the Philadelphia Eagles. 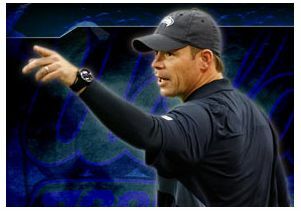 Mora also coached the Falcons in 2005 and 2006.